Home of America’s first president, Mount Vernon is an iconic symbol in American history. After having been passed down through generations of George Washington’s family, the property was finally bought in the mid-1800s, and preserved as today’s beloved historic site. Located on the banks of the Potomac River in Fairfax County, Virginia, the estate is available for public access and open every day of the year, including holidays. We’re peeking into the evolution of Mount Vernon to discover how this quintessential site became a staple of American history. In its early days, the estate today known as Mount Vernon was known as the Little Hunting Creek Plantation, after the nearby Little Hunting Creek. A family property of the Washington family, Little Hunting Creek Plantation was passed down through several generations, beginning with the grandfather of General George Washington in 1674. The property’s name was changed to Mount Vernon when it was inherited by George Washington’s half-brother, Lawrence Washington. He made the alteration in honor of Vice Admiral Edward Vernon, who had been Lawrence’s commanding officer in the British Royal Navy. Throughout its tenure in the Washington family, Mount Vernon went through a series of enormous renovations, most of which gave way to the property’s outlying buildings and gardens. Today, visitors can walk through four separate gardens, outbuildings where laundry, meat curing, and spinning took place, stables, the blacksmith, and more. The home’s architecture resembles the Venetian Palladian style, which incorporates a wide structure with large pillars that open the front of the building to a porch area. The walls are made of stone, though they are made to look like wood. In its prime, the estate was ten times the size of an average colonial home, with 11,028 square feet, two and a half stories, and a full cellar. George became the sole owner of the estate in 1761. He lived there with his wife Martha Washington until his death in 1799. Both General Washington and Martha are buried on site, along with most of the Washington family in a vault known as the New Tomb. Following George’s death, the home began to decline in value, due to the lack of maintenance it received from the generation of owners following George. Luckily, it was rescued in 1858 by the Mount Vernon Ladies’ Association, a non-profit organization responsible for maintaining and preserving the estate. They bought the property for $209,000 - money they fundraised at the leadership of Ann Pamela Cunningham. The group refurbished and repaired the property, recognizing it as an impressive site in American history. The property is still maintained today by this same organization. 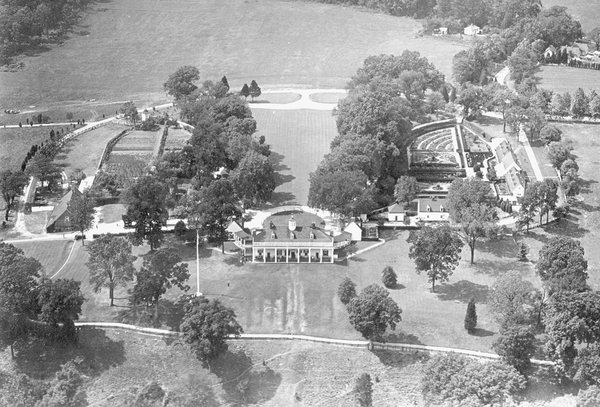 In 1960, Mount Vernon was declared a National Historic Landmark, and was listed on the National Register of Historic Places. Every year, around one million visitors pass through the grounds. Between the Museum and Education Center, there are 23 galleries and theaters which detail the life and legacy of Mount Vernon and its owners. More than 700 artifacts preserved from the 1700s are displayed here, and visitors are invited to wander the 500 acres and 30 buildings the property holds. Mount Vernon contains a wealth of knowledge from pivotal decades in American history. If you’re a Washington aficionado, or new to the stories of the nation’s first president, this location houses opportunities to learn about the legacy of the property, the Washington family, and how both influenced the birth of the nation. With stunning views looking out over the Potomac River, Mount Vernon is an site you cannot miss.